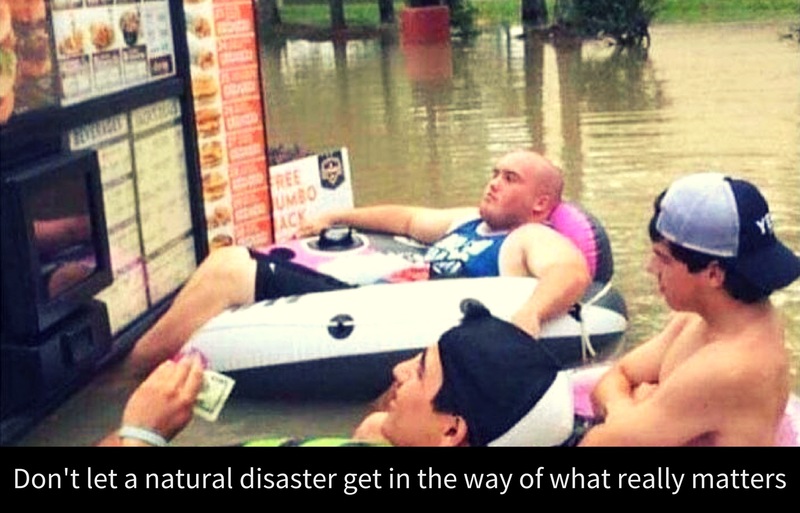 Think Maslow’s Hierarchy of Needs, where we as humans need to meet our physiological need for food and water before safety and security (e.g. shelter) - there is no point in having a lovely place to live if you die because you don’t have water and food! How to get rid of neck pain is similar, there is little to no point in having a quick crack from a chiropractor or some taping on your skin (all of which have little evidence to show they are effective) if you haven’t first prioritised the proven fundamentals to an effective recovery. 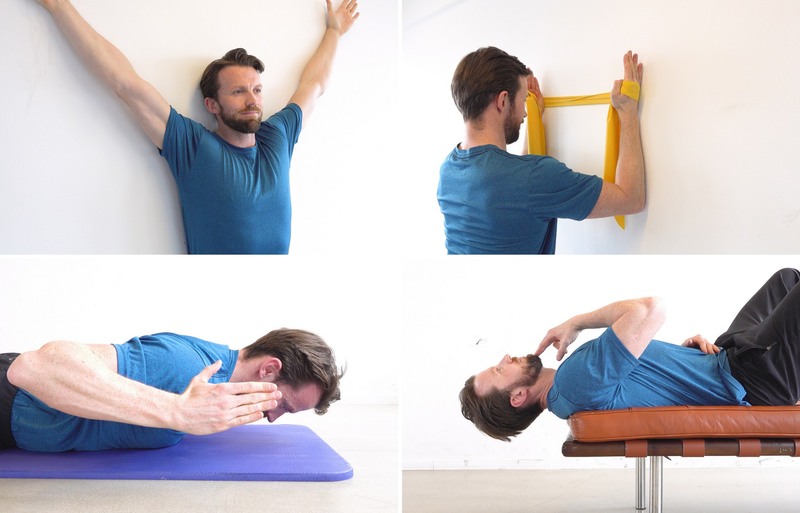 This post is about how to make your recovery from neck pain as effective as possible. 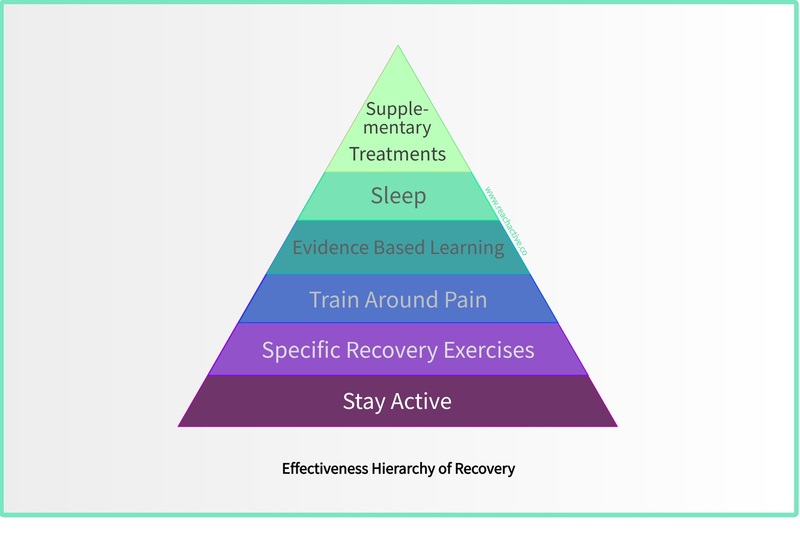 We’ve created an Effectiveness Hierarchy of Recovery to help you better manage your neck pain recovery, know what is most important and to judge whether you’re getting good advice or not. The way this works is that you need to move up through the layers from bottom to top. If you haven’t covered the layer beneath first then much of your time and effort is probably going to waste. It’s important to stay physically active during your recovery to increase the likelihood of a good outcome (look out for a detailed blog reasoning why, coming soon). Continue to walk, cycle, run, or do other activities with your friends and family. However, you should find a balance and make sure your regular day-to-day life is not getting in the way of your recovery. First make small tweaks such as ride on lower gears or set the saddle higher to decrease stress. If it’s still aggravating your injury then catch the train for a few weeks while you do non-aggravating exercises and activities to build up the tolerance in your knee. Now your everyday life is not going to hold you back, it’s important to be doing specific exercises prescribed by a physio as lots of evidence suggests this is the most effective way to recover from the majority of musculoskeletal injuries and pain syndromes. 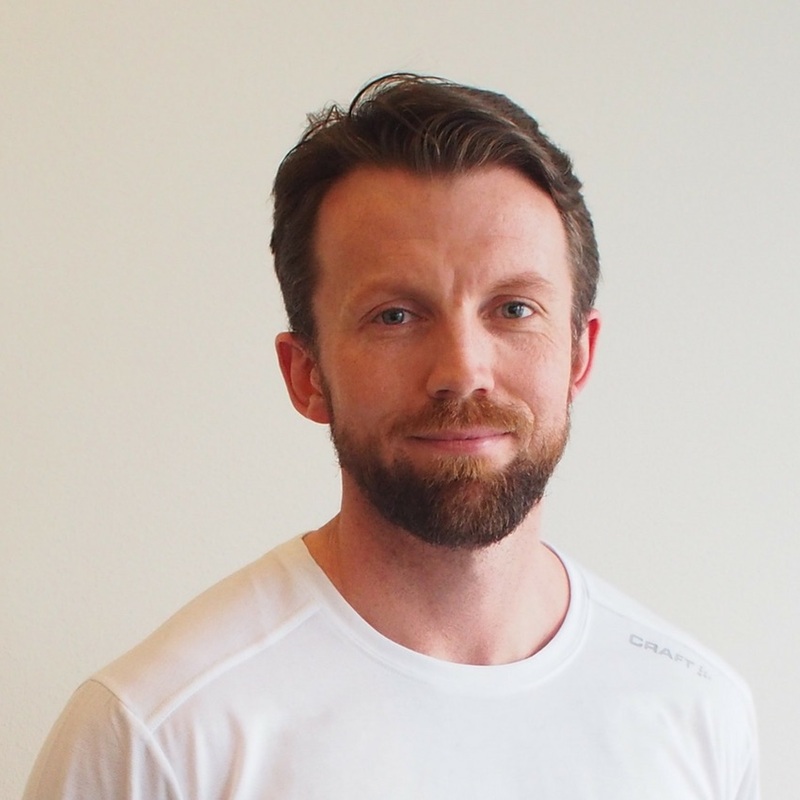 Look to set a goal with your physio, this not only helps with motivation, it also helps to progress your exercises so you can get back to where you want to be and hopefully stronger and more knowledgeable about your body than you were before, so the pain is less likely to recur in the future. To use overuse injury as an example, we often meet people who as a result of rest, see their pain decrease. When they then go back to their pre-injury exercise routine, lo and behold, the pain comes back. The correct course of action would be to continue as much of your regular exercise (sport or training) as possible without aggravating your symptoms, while doing injury-specific exercises regularly. This often means that you have to modify your usual routine somewhat - decreasing intensity for example - but the key here is that stopping everything, is usually not optimal. For instance, if neck pain is stopping you from running as much as you’d like, there are lots of neck-friendly exercises that place less stress and impact on the neck, so you can maintain leg strength and endurance while you are in pain - try cardio workouts on a cross trainer or an air bike would be a good replacement - we find that these devices are less aggravating for the neck. You should be thinking about the load you are putting on your body, especially the painful or injured body tissues (e.g. muscles or tendons). Make sure you don’t cause any sudden spikes in load which may cause you setbacks. Focus on increasing your training load and the amount you do slowly and gradually, it’s one of the most important principles of recovery and prevention. As you are doing by reading this article, the more you know about pain, recovery and prevention, the better you’ll be able to manage your body. Allowing you to do more of what you love without being held back by pain. There is a lot of sound advice out there but unfortunately, there is also a lot of misinformation. So be sure to check the source and whether they follow an evidence-based and active approach. 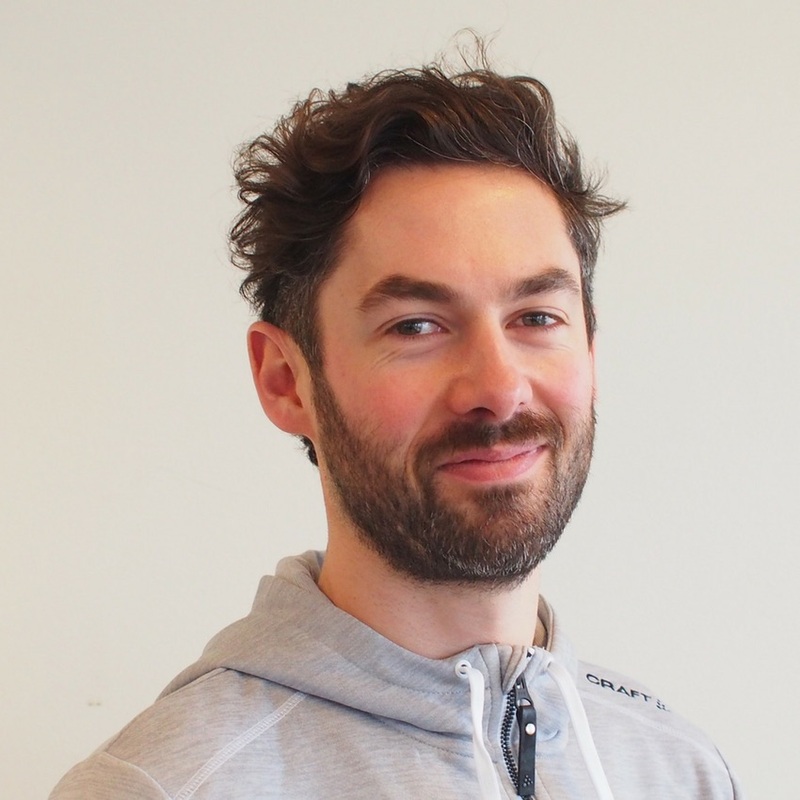 If you want an example, see the profiles of our physio team. There is growing evidence to show that treatment that teaches an understanding of pain and coping strategies, is beneficial. However not all information is equal, and the research also shows that getting incorrect and/or strictly biomechanical explanations from health care-providers (meaning an explanation of pain caused exclusively by a structural or muscular dysfunction in the body), can have a negative effect. For example, being told that you have “wear and tear” on your spine and that this is causing your back pain can, apart from being incorrect or an oversimplification, actually also be pain inducing in itself. Pain is is made up of many factors and affected by not only biological and physiological factors, but also by psychological and social factors. Especially if you have been experiencing persistent pain for a long time, learning these important truths about pain is very important. 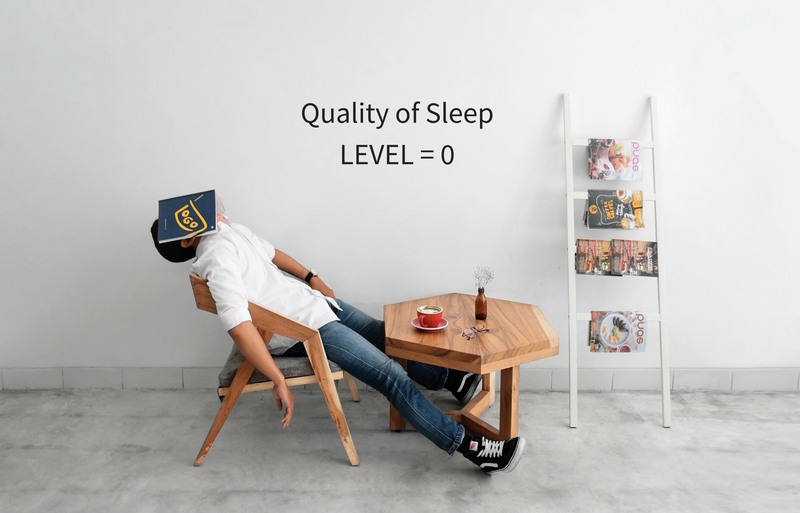 So, focus on creating a habit of getting enough good, quality sleep to maximise your recovery, before you spend your time and money on more speculative treatments that claim to be scientific but have little evidence (see below - Level 6). Therefore, it is important that if you do decide to use any of these, that you use them in addition to your foundation of active recovery, with exercise, physical activity, good education, pain coping skills and healthy habits to boot. Use this practical hierarchy to get rid of neck pain and we’re confident you’ll have an effective recovery journey. As always, fire over questions and we’ll do our best to get back to you. If you are struggling with pain then try our Reach Physio App to get started with your neck pain recovery within 15 minutes.